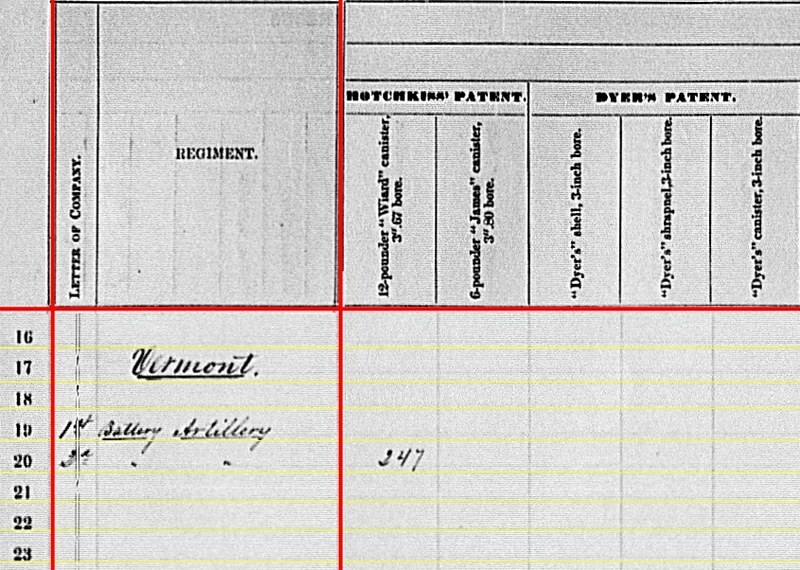 1st Vermont Light Battery: Listed at Port Hudson, Louisiana with six 3-inch rifles (perhaps ending any speculation I might have offered from the previous quarter). Captain George T. Hebard remained in command. The battery was assigned to Second Division, Nineteenth Corps. Hebard’s battery occupied a position just left of center on the Federal siege lines. 2nd Vermont Light Battery: Also at Port Hudson, Louisiana with six 3.67-inch rifles. Although using a column for bronze pieces, these were most certainly Sawyer rifles of cast steel. Assigned to Third Division, Nineteenth Corps under Captain Pythagoras E. Holcomb. The battery occupied one of the works on the right end of the Federal siege line, rather close to the Confederate defenses. There is a fine map from the Atlas volume of the Official Records which shows the respective locations for these batteries. The map annotations call out each battery by commander’s name. According to the map, the 1st Battery had six 3-inch rifles and the 2nd Battery had six 6-pdr Sawyer rifles. 1st Battery: 110 canister, 75 percussion shell, and 860 (!) bullet shell for 3-inch rifles. 1st Battery: 120 Dyer’s canister for 3-inch rifles. Rather significant we don’t see any Hotchkiss, Dyer’s, James, or Parrott reported from 2nd Battery. In a way it corroborates the presence of Sawyer rifles. Those weapons were designed to fire projectiles of Addison M. Sawyer’s design (patented in 1855). 1st Battery: 312 Schenkl shells for 3-inch rifles. 2nd Battery: 99 shot, 1536 (!!) shell, and 524 canister, of Schenkl type, for 3.67-inch rifles. Of note, Sawyer’s patented projectiles featured a large lead sabot that covered almost the entire body of the projectile. Some of those have been recovered from around Port Hudson. There is no doubt 2nd Battery had Sawyer projectiles for their rifles. But there are no columns for Sawyer. So… do perhaps the clerks put “Sawyer” under “Schenkl”? 2nd Battery: 598 Tatham canister for 3.67-inch rifles. Yes, a lot of canister. And certainly something an artillerist would want around during a siege. 1st Battery: Eighteen Army revolvers and thirty horse artillery sabers. 2nd Battery: Eleven Army revolvers and fifty-eight cavalry sabers. As is my mission, of sorts, with these summaries is to translate and demonstrate how these dry numbers translated to real activity afield, the Vermont batteries, while brief, are an excellent case in point. We can match the guns reported – though not without questioning the clerks on 2nd Battery’s guns – to specific places on wartime maps. And from those maps we can step out to what remains of the battlefield today. All contributing to the study of the subject. A small state, Vermont provided only two light batteries up to this point of the war (a third would be mustered in January 1864). Both active batteries served in the Army of the Gulf. Likewise, both would play parts in the campaign against Port Hudson, Louisiana later in the spring and into summer. The receipt date for both batteries is within bureaucratic tolerance – August and May of the reporting year, respectively. 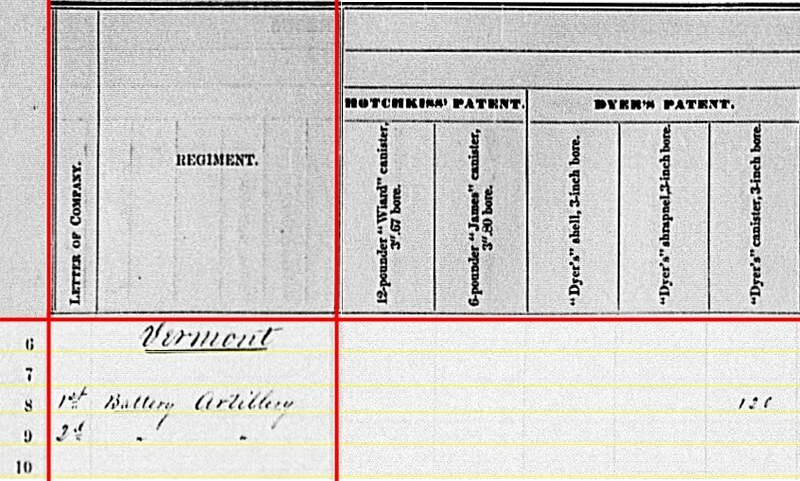 1st Vermont Light Battery: Listed at New Orleans, Louisiana with six 3-inch rifles. In January, Captain George W. Duncan resigned. Captain George T. Hebard assumed command of this battery at the start of the spring. The battery was assigned to Second Division, Nineteenth Corps. 2nd Vermont Light Battery: Placed at Baton Rouge, Louisiana with six 3.67-inch rifles. Assigned to Third Division, Nineteenth Corps under Captain Pythagoras E. Holcomb. When attempting to identify the specific type of cannon assigned to these batteries, I have to pause to offer simply the calibers reported. 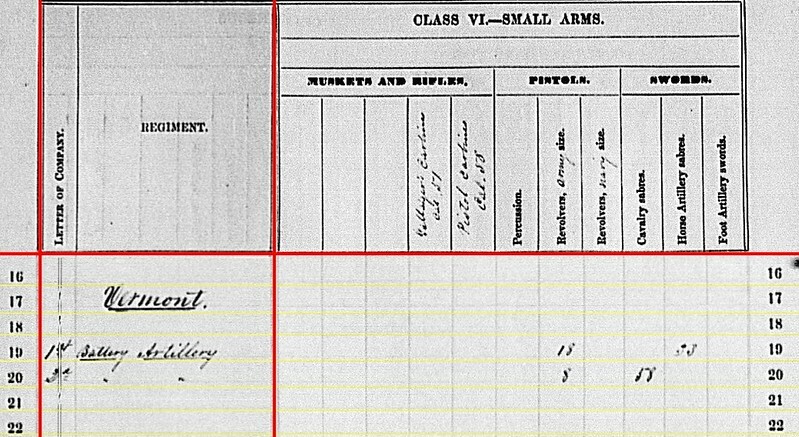 I’m most certain the six 3.67-inch rifles of the 2nd Battery were Sawyer 6-pdr Steel Rifles. But, we see here those are reported as bronze rifles. With so many case where columns were “re-purposed” by the clerks, why not one more. And for the 1st Battery, the weapons assigned were specifically identified as steel rifles. However, there is much inconsistency in the reports, correspondence, and records in regard to “steel rifles”. Some times standard wrought iron Ordnance Rifles were so identified. However, the identification leaves open the possibility that Sawyer rifles, or even Wiard rifles, in that caliber were used by the battery. And that would be just a short list of possibilities. The standard old 3-inch Ordnance Rifle would be the leading candidate. But we might speculate, given 2nd Battery’s association with the Sawyer rifles, that 1st Battery also had weapons of that origin. 1st Battery: 120 canister, 444 percussion shell, and 625 bullet shell for 3-inch rifles. 2nd Battery: 939 fuse shell and 347 canister for 3.67-inch rifles. 1st Battery: Eighteen Army revolvers and thirty-three horse artillery sabers. 2nd Battery: Eight Army revolvers and fifty-eight cavalry sabers. Aside from the precise identification of the cannons, the two Vermont batteries offer a simple report to interpret.